The notorious Burma-Siam railway, built by Commonwealth, Dutch and American prisoners of war, was a Japanese project driven by the need for improved communications to support the large Japanese army in Burma. During its construction, approximately 13,000 prisoners of war died and were buried along the railway. An estimated 80,000 to 100,000 civilians also died in the course of the project, chiefly forced labour brought from Malaya and the Dutch East Indies, or conscripted in Siam (Thailand) and Burma (Myanmar). Two labour forces, one based in Siam and the other in Burma worked from opposite ends of the line towards the centre. The Japanese aimed at completing the railway in 14 months and work began in October 1942. The line, 424 kilometres long, was completed by December 1943. The graves of those who died during the construction and maintenance of the Burma-Siam railway (except for the Americans, whose remains were repatriated) were transferred from camp burial grounds and isolated sites along the railway into three cemeteries at Chungkai and Kanchanaburi in Thailand and Thanbyuzayat in Myanmar. 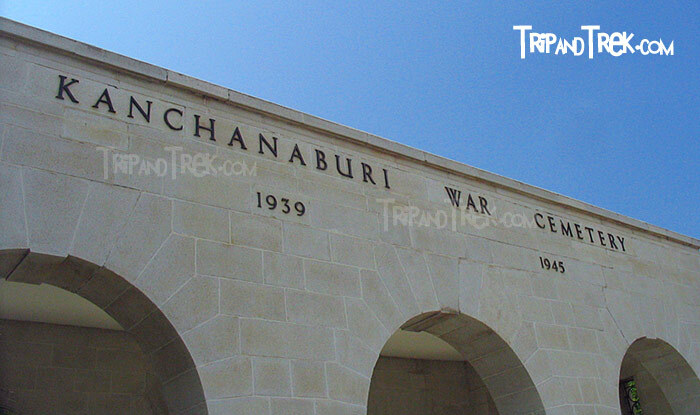 KANCHANABURI WAR CEMETERY is only a short distance from the site of the former 'Kanburi', the prisoner of war base camp through which most of the prisoners passed on their way to other camps. It was created by the Army Graves Service who transferred to it all graves along the southern section of railway, from Bangkok to Nieke. Some 300 men who died (most from a Cholera epidemic in May/June 1943) at Nieke camp were cremated and their ashes now lie in two graves in the cemetery. The names of these men are inscribed on panels in the shelter pavilion. There are now 5,084 Commonwealth casualties of the Second World War buried or commemorated in this cemetery. There are also 1,896 Dutch war graves. Within the entrance building to the cemetery will be found the KANCHANABURI MEMORIAL, recording the names of 11 men of the army of undivided India buried in Muslim cemeteries in Thailand, where their graves could not be maintained. The cemetery was designed by Colin St Clair Oakes.